Regarding the San Luis Obispo County Board of Supervisors meeting on the Las Pilitas Quarry, it was good to see that some of our supervisors actually read and came prepared to the meeting with facts and figures rather than a predetermined speech based on politics versus facts. projects denial were asked and answered … ignored by some. There could have been some explanation as to why you could not accept these facts or at least a rebuttal to the accuracy. We, as a community, are entitled to that by our elected officials. It was sad to see that our county government has become so political. I have been a member of the Santa Margarita Advisory Board (SMACC) for some time now. I attend the meetings regularly and get involved in special projects as in this one reviewing the EIR. I was on the committee to review the project. It was my understanding that our input to the supervisors was valuable and to be taken into consideration, as we in the community have put the time and effort into reviewing projects as this one and many others. Unfortunately three of the supervisors chose not to comment or take into consideration the time and effort put in by the SMAAC board as their decision did not reflect or mention any consideration for their time and vote to support the project. It was as if saying your time and effort does not count because I know better than you without even an explanation. Not because of the no vote on the quarry, but due to the fact that our time and efforts were not even considered in the decision making, I have serious reservations about continuing to dedicate my time and resources in being a SMAAC member. Butch Pope is a lifelong resident of San Luis Obispo County who has lived the past nine years in Santa Margarita. Pope has served on the Santa Margarita Advisory Board for five years. Don’t miss local opinion, like CCN on Facebook. Hey, Butch. You do realize we live in a democracy, right? So the BOS represents the PEOPLE, the ones who vote. Business does not get a vote, although they do get to wine & dine elected officials. And boy did the Coles and Souzas wine & dine these folks! There is currently a shortage of low income housing in SLO. Fact. If a business person approaches the BOS (let’s say Grossman on the Dalidio property) and says ” can fill that need oh, and provided jobs for the community.” Is the BOS required to approve it because there is a need? I say no. The project MUST fit with the surrounding area, the neighborhood, and the supes must vote on behalf of their constituents. Facts don’t count in the pursuit of legalized plunder. If there were any POLITICS in play it was certainly obvious in Compton’s and Arnold’s demeanor. The SMAAC board is loaded with people who are friends of the owners and developers of the quarry. Some are truck drivers who stand to profit directly from the quarry. Butch Pope is in the construction industry. Those people on the SMAAC board should have recused themselves. Hell, even Rob Rossi is on the board and he doesn’t even live near Santa Margarita. The three supervisors did explain their position and probably knew of the bias of SMAAC. 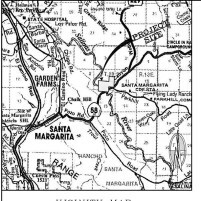 All you pro quarry people, who mostly do not live in Santa Margarita, need to realize if they figure out an alternate haul route the project would probably be approved. And a big thanks to Debbie Arnold, the 5th District Supervisor representing the people of Santa Margarita for throwing the citizens of that community under the gravel truck! The geographical area that is represented by SMAAC is well served by elected representatives. They voted to support the Las Pilitas Quarry based on their understanding of the project and or the demand for our available resources. I know from personal experience that some products are not always available and having alternatives is a must. This is why the Staff’s claim of a significant increase in quarry truck traffic through Santa Margarita, because of Las Pilitas is un-factual. It was mentioned at the B.O.S. Meeting that SLO County is 182 million dollars in deferred maintenance. Of course many don’t care about road repairs, road upgrades or bike paths but among the young, our future, these resources will be absolutely necessary at any expense. As we taxpayer demand substance for our tax dollars and a local solution like Las Pilitas is not employed, it will be very disturbing to find out that much of our taxes will be spent on trucking from afar and in some cases, on the very same roads that we want repaired. Unless Bishop Peak or the likes of Morro Rock is mined, the granite will definitely come through Santa Margarita. This is the luck of the draw, the resources are where they are and that will never change. If the public truly understood the disservice that has been dealt to our future, every word provided by the Planning Staff would be re-evaluated by a 3rd party. The problem lies in the fact that all tax payers have already funded Staffs words and objectivity with science will be at the expense of an individual tax payer, the applicant.. A cushy position for Staff, if there is a battle, job security and they know that too.